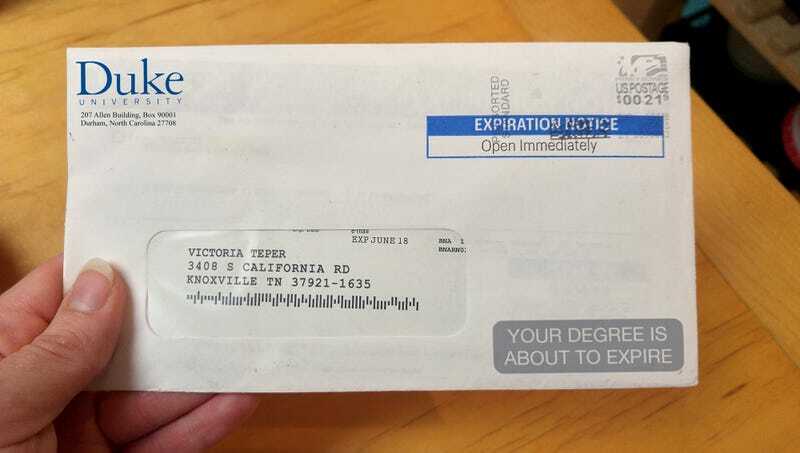 DURHAM, NC—Urging millions of 32-year-olds to report immediately to the registrar’s office, colleges across the country sent out a reminder Wednesday to every student who graduated in 2008 that their degrees were about to expire. “Any alumnus who wishes to renew their associate’s, bachelor’s, or graduate degree is to return to Alumni Relations by Friday, June 8, or else their degree will cease to be valid,” said Glenda Lee of Duke University, one of thousands of administrators who instructed the entire class of 2008 to arrive on time and prepared with photo ID, their voided diploma, and the $10,000 renewal fee. “Of course, you will then be required to demonstrate continued knowledge by briefly retaking all your final exams, rewriting your senior dissertation, and greeting the university president with a handshake again before accepting an updated diploma.” At press time, millions of post-grads nationwide were handcuffed, arrested, and jailed for operating through the job market with expired degrees.